The Galápagos archipelago is an isolated group of islands which serve as a natural laboratory for the study of evolution. The islands are home to the marine iguana – a highly specialised sea-going lizard which is found nowhere else on earth. Marine iguanas occur across the archipelago, usually forming one separate population per island, except on San Cristóbal Island where there are two. Here, the two populations are genetically separate and don’t mate with each other; this indicates that they are becoming separate species (speciation). To try and understand why they are speciating, and how the different populations across the archipelago are related to each other, we collected DNA and used a selection of genetic techniques to reconstruct the evolutionary past of this species at various time points. We found that the marine iguanas split from their sister-group, the Galápagos land iguanas, much later than previously thought, and that the marine iguana has existed as one species for a surprisingly long time (around 4.5 million years; fig. 1). Most Galápagos organisms form many new species in this length of time. However, the different populations of marine iguanas do seem to be separating, this can happen because the populations experience different environments and therefore adapt differently. So although we can see that speciation processes are happening, the long-term pattern (represented by phylogenetic trees) indicates that this speciation seems to stop, and new species are not formed. These two findings seem to contradict each other, and in order to make sense of that, we studied how the different populations interact with each other. We found that individual iguanas sometimes move from one island to another, and that they are able to successfully mate with the resident iguanas on the new island; this is called ‘interisland hybridisation’. This hybridisation process might be very important for the evolution of marine iguanas, because it brings new genes into a population, increasing the genetic diversity. This genetic diversity is the raw material upon which natural selection can act. Therefore, when there is more genetic diversity, there is more potential for quick and effective adaptation, which aids survival in a rapidly changing environment. This hybridisation might explain why the marine iguana is able to persist on all the Galápagos Islands, even though the environment is constantly changing. In this way, hybridisation can be a positive force that aids the survival of populations in the long-term. It also explains why the separating populations do not eventually become new species – hybridisation mixes up the genepool, stopping and perhaps even reversing the speciation process. Fig. 1. Population structure across the Galápagos archipelago in marine iguanas, showing genetically separate units and their relationships (A). 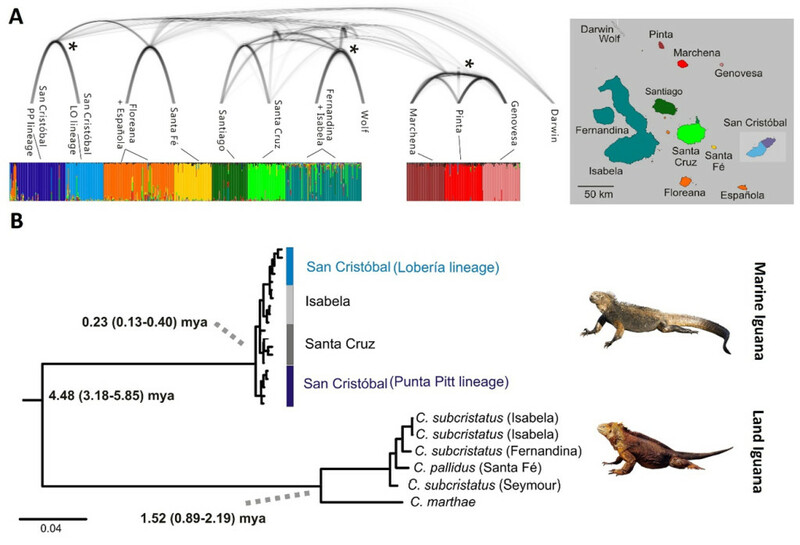 Phylogenetic relationships within the two types of Galápagos iguanas, showing the formation of new species in land iguanas (C. marthae) in contrast to a lack of clear species formation in the marine iguana (B). This finding is interesting for evolutionary biologists because the interaction of these two processes – speciation and hybridisation – are not well understood, and our results give insight into how they can work together to influence the evolution and success of a species. Our findings also challenge how we interpret long-term evolutionary patterns. Since we see no new marine iguana species formed in 4.5 million years, we would usually expect that there was no speciation happening – yet we can clearly see that it is. What our work indicates is that speciation processes can occur even if they aren’t visible in phylogenetic trees, and that speciation may be important for the evolution of an organism even when it does not generate new species. Hybridization masks speciation in the evolutionary history of the Galápagos marine iguana.